So, that's my list. Share some of my favourites? Have ones to recommend to me? Let me know in the comments! Is it monotonous to say that I adore your list...mostly because I agree with almost every single one...and have almost all the same ones on my list...yay! You have a bunch that I have to check out. I loved Geek Girl. Cindy Bennett is coming out with a book in 2013, titled Rapunzel Untangled. I am anxious to check that one out. As always, thanks for hosting. I definitely feel like I am missing something HUGE by not having read Code Named Verity yet! I need to get on this!!! I was wondering about Geek Girl I'll definitely have to check that out! And of course Crown of Embers was SO amazing! Maybe my favorite sequel oh except for Ender's Shadow but right up there! I had Throne of Glass, Under the Never Sky and Touch of Power on my list too. Good picks. I haven't read many of the books on your list (the only one I actually know is Shatter Me), but a lot of them are on my immediate TBR (like Shadow and Bone). And I already know I'm missing out on something by not having read Rae Carson's The Girl of Fire and Thorns and The Crown of Embers yet. So many good books this year! I'm at 110 read for 2012, and had a hard time narrowing things down as well. Nice list...Code Name Verity was a great book, I loved both of the girls, especially Verity! I LOVED Shatter Me and Under The Never Sky! Really really want to read Shadow and Bone. Great list! Code Name Verity is one of my favorite books of the year -- and of all time. I couldn't stop crying, but I loved it start to finish. And I'm a big fan of the Song of Ice and Fire series as well. Nice list! This list definitely gives me some new books to check out! Thanks for the recommendations! Shadow and Bone and Code Name Verity are on my list as well! They were so amazing. I am so happy to see Rae Carson on this list. The series is great. But I just love Humberto :-). Code Name Verity is my number one this year. What a great book. Daughter of Smoke & Bone was okay too, but the Bardugo book was better. Oddly, I learned of it through a review by Laini Taylor (author of DofS&B) in the NY Times. This only furthered my confusion of the two titles lol. Great list! There are a few on here that I really must read since I hear so much about them. Shadow and Bone is on my list. Gilt didn't quite make the cut but I did really love that book. Gilt and Shatter Me are great choices! And I see a few that I really need to read because I've heard so much about them. I haven't read any of the books on your list, but I do have about half of them on my TBR list. I haven't read any of the books on your list, but some of them are on my TBR list. They all sound quite fabulous! A lot of my favorites made it on to your list! But I have to say that I am SO happy that Julia Quinn is on there, because I LOVE her and her novels! I've seen "Shatter Me" on so many lists. I want to read that book and was going to buy it on my kindle, but after looking at the sample I realized it's not really in the best format for an e-reader, so I will wait until I get a hard copy I suppose. So many of those are on my TBR, so I hope I'll be able to get to them next year. :) And I totally agree about Code Name Verity. I don't know what I was expecting, but that book was so haunting and crazy. I haven't read anything like that before. It was SO hard to pick, lol. I haven't actually read any of your picks but everyone I've talked to has loved Code Name Verity, including my blogging partner. Great list! You may have to wait until tomorrow to look at mine...had malware detected on my site, and am waiting for Google to remove their warning. Thanks for your list - many I'd like to put on my list for 2013. 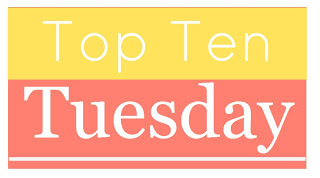 So excited to be participating in your Top Ten Tuesday!!! Looking forward to many, many Tuesday's in 2013! All great reads I still have to finish except the last one. Feel free to check out my TTT here. About Geek Girl - omg I know, I absolutely fell in love with this book last year, I didn't expect something that amazing & I was totally crushing on Trevor as well as on their relationship, & I rarely have book crushes, so amazing, so I'm glad you loved it! Shadow and Bone is also on my list- it was such a great read. I wasn't expecting to like it as much as I did. I agree totally with the new Healer series from Snyder! I'm such a huge fan and her new work keeps me coming back for more each and every time! I might have to try Throne of Glass at some point... people seemed to like it. I'm excited to see Gilt on your list, it's on mine as well and I also can't wait for Katherine Longshore's next book! AGREED! Shatter Me was SO good! Shadow and Bone is sitting on my shelf waiting for me. Fun lists! Code Name Verity was great! But it's not on my fave 12 in '12 list, since I only blog YA beyond the bestsellers - and could tell that this one would hit the chart before I had a chance to early-review-post it! Fabulous List of books, lot of my favorites but "Shadow and Bone" is my most favorite. I've just submitted my website to your top 10 tuesday list, I'm a new blog and I'm looking for great people who share the same passion as mine own: books. Reading is a good hobby but the problem is that how we will manage the budget for new books especially for the students they could not afford the new books so here is a good choice that they can easily get the books on rent from online book stores instead of purchasing new books like Amazon and Valorebooks...!! !